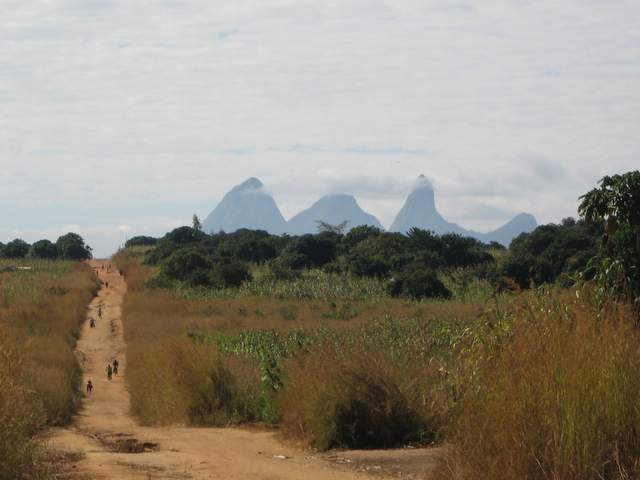 Diary MOZAMBIQUE: Yep, Clare got her way again and off we went to the border between Malawi and Mozambique at Mandimba. Very easy and straight forward. Provoked huge guffaws of laughter from Customs and Immigration in my attempt to resurrect my very, very rusty Portuguese. Nice people. Spent the first night in Cuamba. Did a 50/50 with the hotel…Clare and two kids in roof tent and me and two kids in a room. Were pretty knackered so decided to try the restaurant in the hotel….big mistake…I had chicken, but I’d swear it was someone’s rubber duck as I had to get my Swiss Army knife out to cut it and was still chewing two days later. The Portuguese seem to have taught the Mozambicans two things. Portuguese and how to make bread, which is a huge improvement on the “white sliced” of ex-British East Africa. Road from Cuamba to Nampula was so bad it blew both rear Old Man Emu shocks, these had survived all that Sudanese and Kenyan roads could throw at them. I wonder if OME will give me a new set….they’re only 9 months old…The scenery is gorgeous though. Dumpling like mountains of rock plonked down amidst dry grasslands. Very easy on the eyes.